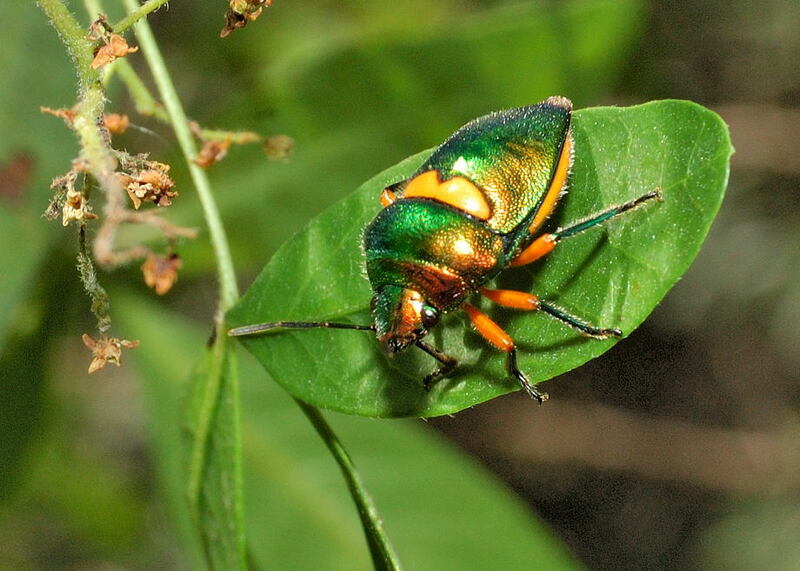 This page contains pictures and information about Green Jewel Bugs that we found in the Brisbane area, Queensland, Australia. We saw a metallic green insect flied pass in front of us and rest on a leaf. We thought it could be a green beetle. 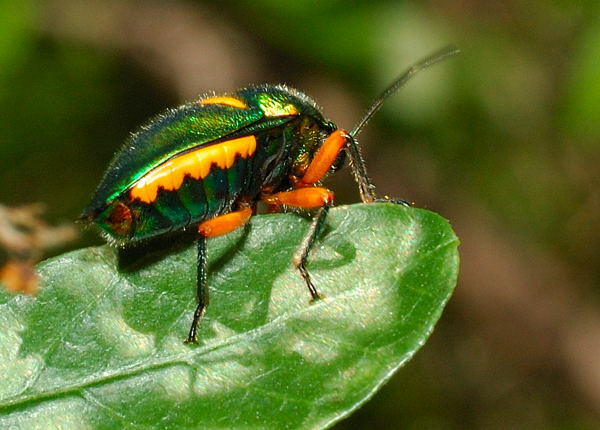 Came closer and found that it was the Green Jewel bug. 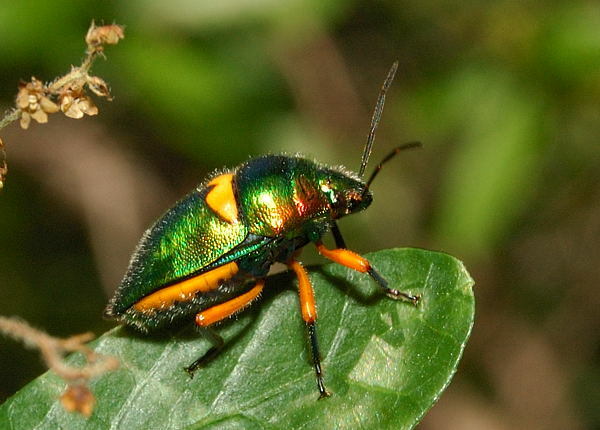 The bug is metallic dark green in colour, with orange mark on its back at the base of the scutellum. Its legs are orange-brown and dark green. 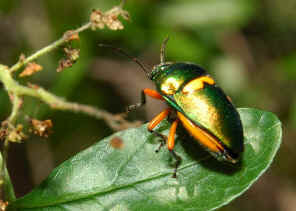 Under its large shield, we can see the orange edges of abdomen. It rested on the leaf for about a minute, then turned around and flied away after we took those photos. 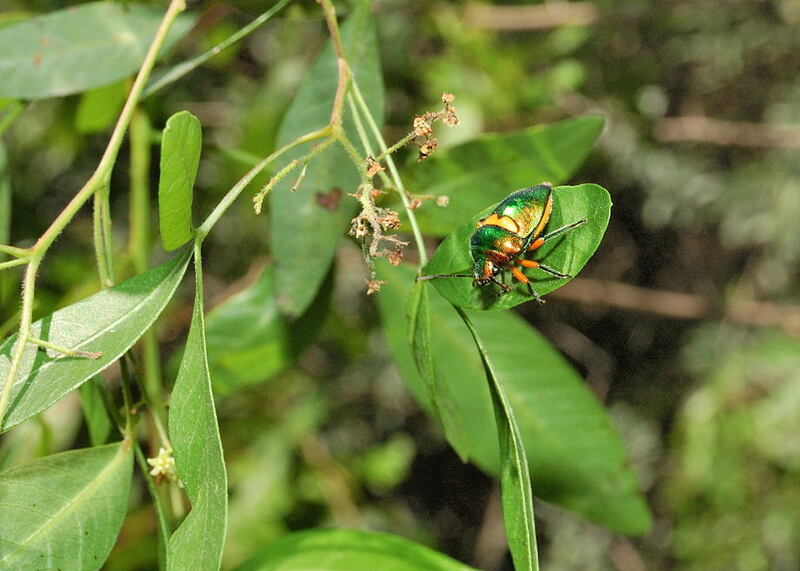 As a shield bug, it is relatively a good flier. 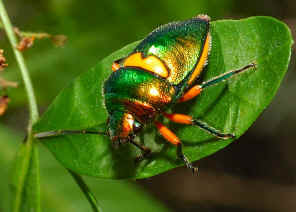 We saw this bug once in Brisbane Botanic Garden on Sept 2007. 1. Insects of Australia, CSIRO, Division of Entomology, Melbourne University Press, 2nd Edition 1991, p 508, plate 3U. 2. SCUTELLERIDAE Shield-backed Bugs - Save Our Waterways Now, by Robert Whyte, 2007. 3. Lampromicra senator (Fabricius, 1803) - Australian Biological Resources Study, Department of the Environment and Heritage, Commonwealth of Australia 2005.